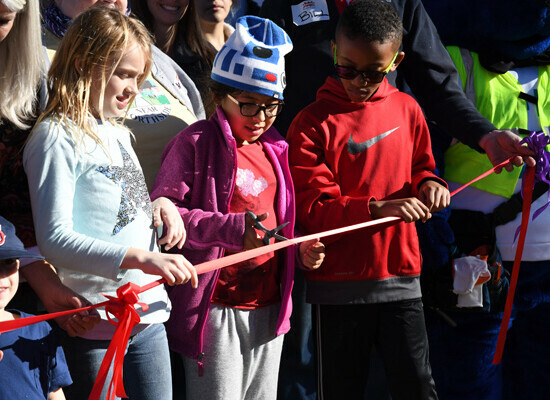 Christmas came early to more than 9,000 children in the Lindale Park area of Houston as clamored onto the new playground at St. Alban’s Episcopal Church on Saturday, November 19. 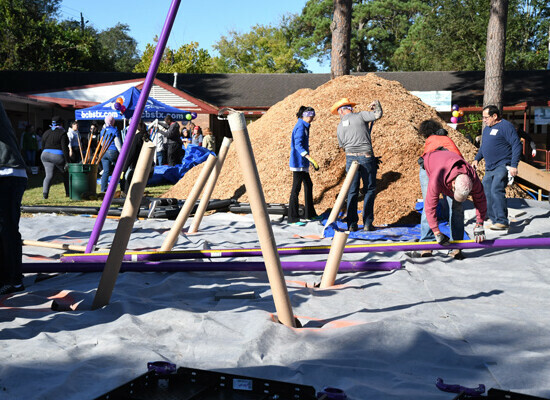 The new play area was built in a few hours with the help of 200 volunteers from BlueCross BlueShield of Texas, KaBOOM!, Avenue Community Development Corporation, Lindale Park Civic Club and St. Alban’s. The Rev. 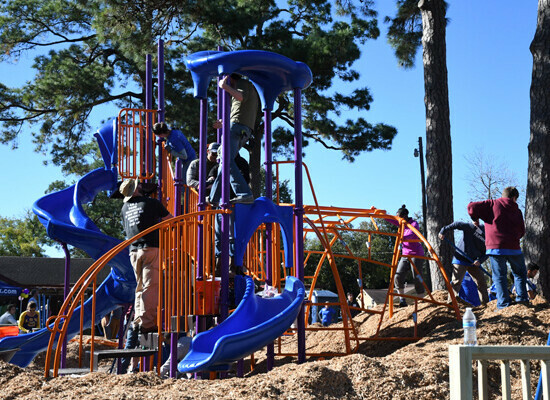 Bill Laucher had wanted a playground on a church campus for a long time to answer the pressing need in the Lindale Park area. “It was around the time the Bishop was getting the word out on missional communities. I knew that the walking traffic for our neighborhood is the street that goes by our church. There is no green space or park in our neighborhood, and we’re the only ones with the big yard but the idea just sat for a long time, until Gwyn Guidy came around,” Laucher said. Laucher met Guidy at a meeting of the Lindale Park Civic Club. Guidy, now the Coordinator of the Planning Committee of the Playground and Jr. Warden at St. Alban’s, had plenty of experience in helping to build playgrounds, fundraising, recruiting volunteers, writing grants and contacting key members of the community. Both Laucher and Guidy agreed that God works in mysterious ways. “It was all in God’s plan for this to happen,” Guidy exclaimed. “I had stopped being a Christian for a very long ago until my mom passed away. The more I interacted with the neighborhood and people who were Christians, the more I began to want that,” she said. Seeing how Laucher interacted with everyone in the community, even through hard times, and having a spiritual need to become closer to Jesus Christ, is what encouraged Guidy to want to become baptized in the Episcopal Church. The strong bond Laucher and Guidy shared made it easier for them to work together. Laucher got the green light to begin planning the construction of the playground after the Diocese of Texas agreed to the location. 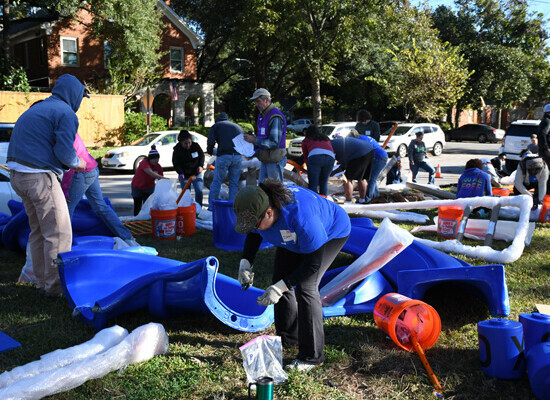 “The Diocese of Texas is committed to serving our neighbors, with businesses, civic leaders and other religious organizations—to increase life, health and joy, to heal our divisions, to enjoy together the life of abundance God intends for all,” the Rev. Kai Ryan, Canon to the Ordinary at the Diocese said. 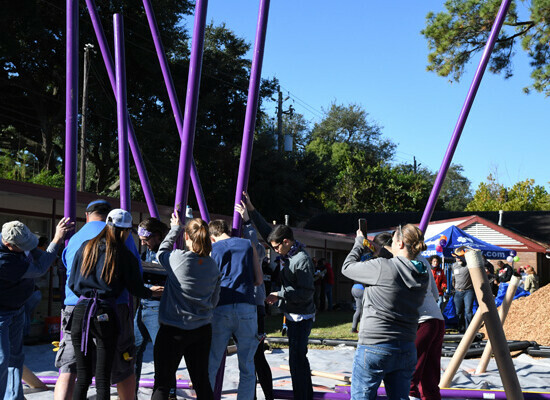 Laucher said he felt the idea of the playground fit nicely within the Bishop’s call to build missional communities. Getting the permits from the city had its obstacles, but the job couldn’t have been completed without the help of all the partners and support from the Houston City Council. There are several health benefits children gain by having and playing at a playground. “When children have a safe place to play they can interact with other children. Not only is it great from a physical activity, but it gets them used to being physically active and [helps them] become more social,” Dr. Bob Morrow, from BlueCross BlueShield, said. 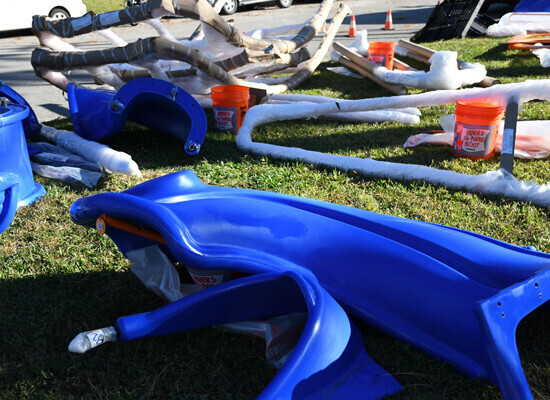 Kids and adults of Lindale Park helped create the look of the play area during a special design day—from the amount of slides, swings and the colors—everyone who participated had input about how they wanted their new playground to look. “We sat down with kids and adults from the neighborhood, and anyone directly affiliated to St. Alban’s. Kids got to draw exactly what they wanted—you get things like swimming pools, trampolines, tree houses—things that aren’t necessary possible, but then we go around with the adults and hash out what those ideas are and we go and pick exactly what components we will incorporate,” said Allan DuBose Jr., KaBOOM! Project Manager. 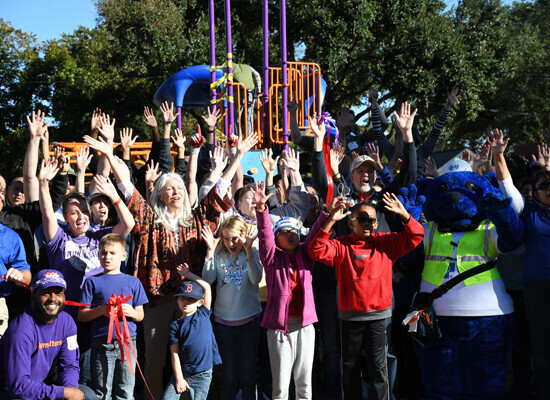 For 26-year-old, Maggie Rivera, having a new playground at St. Alban’s is monumental. Rivera has been a member of the church since she was eight years old. 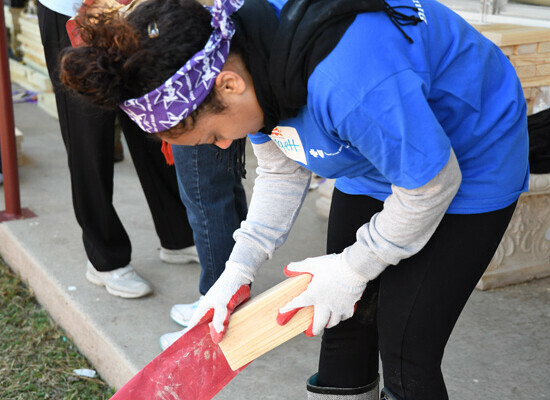 She’s seen a lot of changes throughout the years and couldn’t skip the opportunity to volunteer. “Seeing so many people, members and non-members of the church come together to work on this project is great. 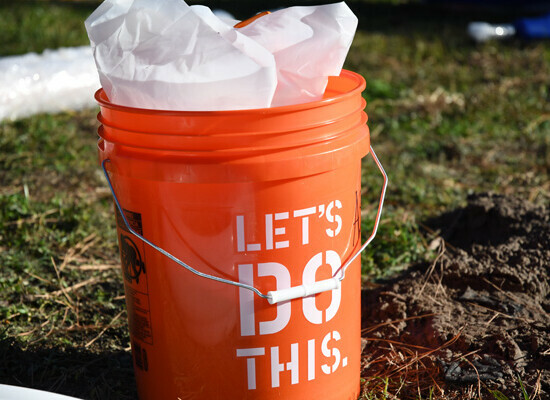 It really shows how working together comes a long way,” Rivera said. 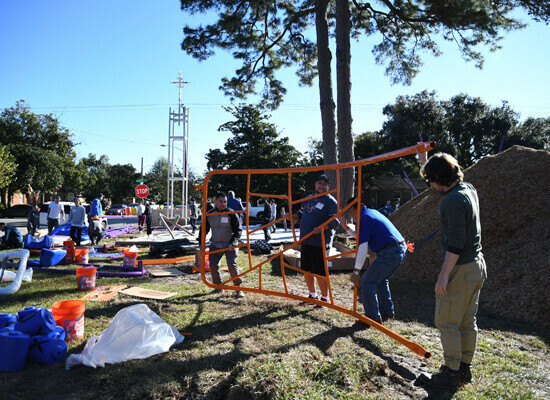 For Laucher, the playground will be another way for the church to interact with the families and to reach out to the community. 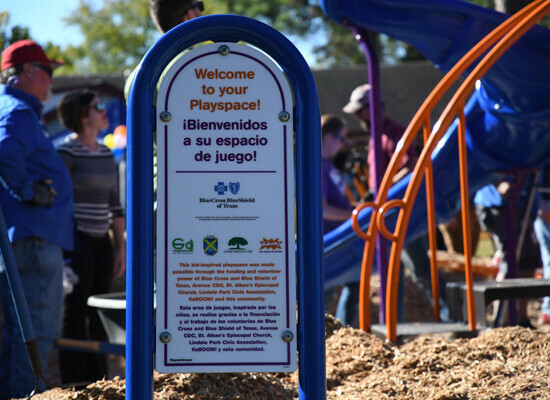 “We hope the playground allows us to find out what the real needs of families are, to begin conversations with them and earn the right to introduce people to the Lord,” Laucher said.